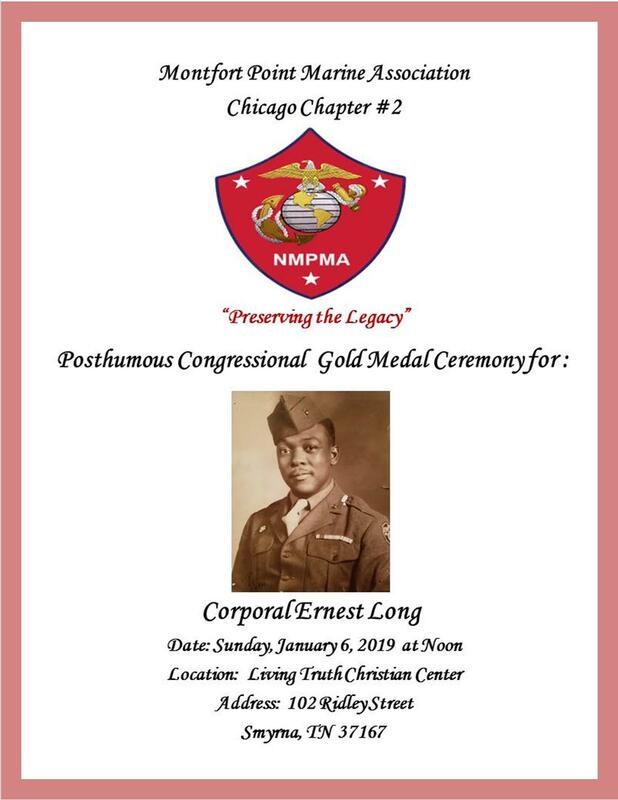 On Sunday, January 6, 2019, the Congressional Gold Medal was posthumously awarded to Ernest Long who was a Corporal in the U.S. Marine Corps during World War II. The Congressional Gold Medal is the highest civilian honor available in the United States. In 2011, President Barak Obama signed legislation authorizing a congressional gold medal commemorating the Montford Point Marines. On Jan 6th, National Montford Point Marine- Chicago Chapter President Sharon Stokes-Parry presented the medal to Mrs. Delois Long as family and friends listened to the stories of the courage and dedication these marines displayed as they overcame many obstacles in order to serve our great country. Mr. Long was a lifelong resident of Rutherford County and entered the Marines as part of the Montford Point Marines on February 5, 1943. He worked in supply and was stationed in the Samoan Islands during the war. Years later he would recount to his family that he was supposed to be deployed to Japan a few days before the bombing of Hiroshima but he did not have to ship out. Whether enslaved or free, African Americans have served bravely and well in every war since the Revolutionary War. In 1942, President Delano Roosevelt and the Congress decided that a long standing policy, which had denied participation of a large segment of the population from active or inactive service in the Marine Corps, should be abolished. As a result of a presidential directive, black men were recruited for duty in the Marine Corps. These men of color from all states were trained at Montford Point, a separate part of Camp Lejeune, North Carolina, the largest Marine base in the eastern United States. Approximately twenty thousand (20,000) black Marines received “boot training” at Camp Montford Point from 1942 to 1949. In 1948, President Truman directed that all U.S. armed forces desegregate. Twenty years after World War II, in the summer of 1965, an enterprising group of Marine veterans from the Philadelphia area developed plans to hold a national reunion of Montford Pointers. In September of 1965 over 400 former Marines, retired and active duty members representing 17 states, attended the national reunion of these WWII veterans. 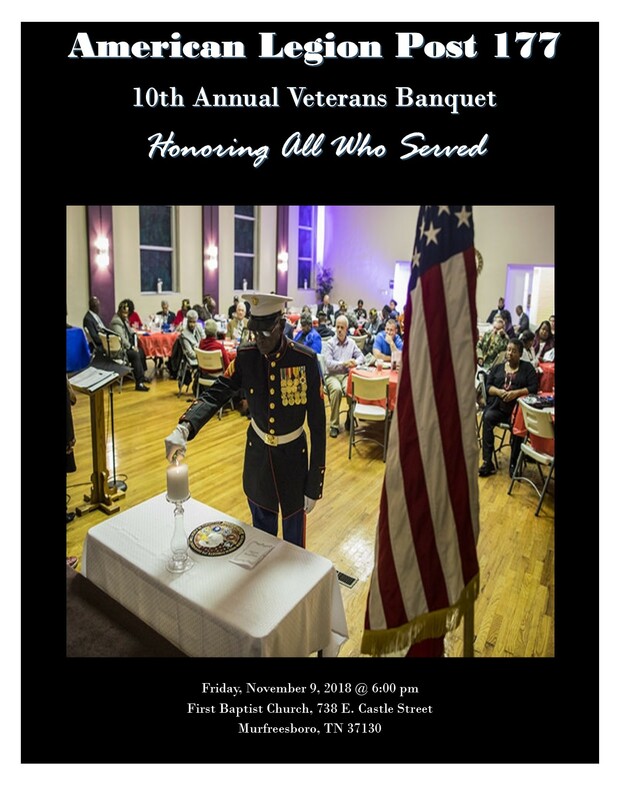 The patriotic response led to the establishment of the Montford Point Marine Association, Inc., a non-profit veteran organization, chartered in Pennsylvania with chapters immediately organized in 11 major cities. In spite of the challenges of living conditions, lack of equipment and racism within the corps and the communities where they lived, the Marines who were trained at Montford Point were still successful during their wartime experiences and battles. Mr. Long served our country and then returned to serve our community. He was educated in Rutherford County, TN. and worked for Veteran's Administration (VA) Hospital for over 35 years. He was the oldest Deacon for Mount View Baptist Church, Smyrna and had been Sunday School teacher and Superintendent. In addition, he played piano for their choir for over 60 years and was very active in his church and community. Mr. Long was one of the individuals who worked diligently on the committee to get a newer Rosenwald School built in Smyrna. He was married to Delois Shipp Long for over 65 years and had 2 children, 4 grandchildren and 3 great-grandchildren. He was a great man and a great fisherman too. Lastly, he believed in the value of education. He and his wife, Delois, ensured their children, grandchildren and great-grandchildren received great educations by providing the means for them to pursue all of the educational opportunities available to them. Although, Mr. Long passed away in November 2014 at the age of 92, his service (between the years of 1942 – 1949), during WWII, qualifies him to receive this prestigious award.